In partnership with WD and Synology, HEXUS is giving you the chance to win a fantastic network-attached storage solution for your home or office. Up for grabs in this incredible competition is an award-winning DS216j NAS bundled with an industry-leading 4TB WD Red hard disk. Built for optimum NAS compatibility, WD Red is our drive of choice for home servers, and we aren't alone as last year's sales data estimates that eight out of ten NAS drives sold were WD Red. A fabulous combination, but here's the best bit: we have ten - yes, ten - of these bundles waiting to be won! Want to be in with a chance? Simply answer the following simple question, and don't forget, you can also claim a second entry via Facebook! The competition winner will be picked at random from all eligible entries that arrive by midnight of the closing date, April 29, 2016. The winners will be notified via email by May 6, 2016. The winner must claim their prize within 7 days of the promoter sending notification. If the prize is unclaimed after this time, HEXUS reserves the right to offer the unclaimed prize to a substitute winner selected in accordance with these rules. 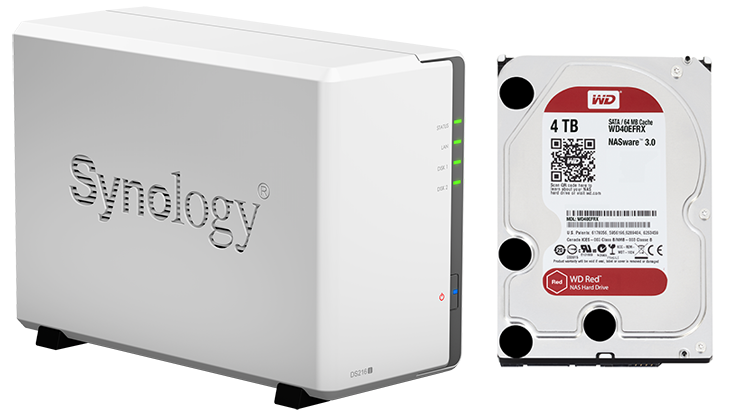 The prize is one of ten Synology DS216j NAS units and a 4TB WD Red hard disk. One of 10? Seems pretty good odds, thanks! I love me some storage. Count me in. thanks Hexus.